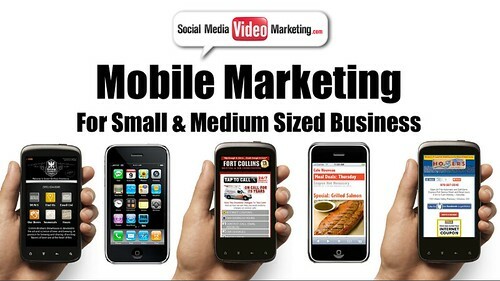 Is Mobile Marketing Already Part of Your Marketing Strategy? How fast is the mobile communications world growing today? According to industry analysts IDC, the number of people accessing the Web on mobile devices is expected to grow beyond 265 million people by 2016, from around 174 million smartphone and tablet users today. IDC predicts that by 2015, more U.S. consumers will access the Internet through their mobile devices than through personal computers. Additionally, more people will be buying products via their devices; IDC estimates that global business-to-consumer (B2C) mobile commerce spending will reach $223 billion by 2016, a six-fold jump from 2011 numbers. As a business owner, you need to be ready for this new business paradigm. Surely, you want to focus your marketing and sales efforts to reach the widest and most relevant audience. How do you do that? Well, if you presented that question to two marketing experts, you might come away with three or more answers. There are many trends in the current market that you need to be aware of, but maybe not necessarily adopt. Take social media, for example. Yes, it is a powerful platform, but does it generate instant turnover and ROI? If done right over a long period of time, the social Web can definitely increase your revenue; but it takes time, expertise and whole lot of mistakes along the way. Not sure we all have time for that. Mobile, on the other hand, is a platform you need to study and act on immediately. Why? Well, because the market has spoken and mobile devices such as T-Mobile phones are dominating. The trend shows no signs of slowing down, either. Several mobile trends are on the way up, including mobile payments and location-based marketing. And according to the research specialists eDigital Research, younger women are becoming the biggest owners of smartphones. These are trends worth noting for your business. In the Western world, and even in emerging markets, the mobile phone is mainstream. Period. Consumers depend on it more and more, and you can no longer ignore the device that Strategy Analytics reported is found in the hands of one billion of people across the globe. 52 percent of mobile device owners use them while they’re in a store to get help with a purchase. It’s obvious you should be investing your resources in a platform that’s got these kind of numbers. Not just that, but when you employ a mobile-platform marketing strategy, your marketing efforts reach people personally, on their own time, in the location you choose and with the offer that’s right for them. That’s the quality of engagement at work. I think we all agree that mobile is the future in terms of sheer numbers, but it goes deeper than that. Forget quantity for a second, and imagine computers and mobile going head-to-head among the same number of people, with equal access to your content on both platforms. What about the quality of engagement you can expect to see on mobile in comparison to that of the PC? Well, let’s start with location. Smartphones have integrated sensors. The GPS sensor is one that, when activated, pinpoints the location of the user while the phone is on. In knowing this information, marketers can find geographically specific and relevant potential buyers who come equipped with a shopping tool in their pockets. This is far more powerful than a computer was a few years ago. With a good mobile strategy, your business can reach out to customers right where they are, helping to boost their engagement and ultimately turn them into a customer. What kind of customer? Well, the ideal customer, of course: One you can retain for a long time. Are customers walking by your retail establishment? A good mobile strategy can offer them an exclusive discount if they enter right now. In fact, sharing the offer with their friends might enable them to receive a larger discount (and you another customer). Mobile’s ability to localize digital advertising is one of the biggest reasons your business needs to include mobile marketing efforts. Another groundbreaking aspect of the smartphone revolution is the proliferation of mobile apps. These programs run on consumers’ mobile devices and offer them various experiences, such as gaming, content and communication. The good news for business owners is, smartphones have the ability to analyze what type of mobile content being accessed by people and target them accordingly. The bottom line is, mobile is a train leaving the station at increasing speeds – find a seat onboard now. Hillel Fuld, tech blogger and mobile enthusiast, works as Senior Evangelist at inneractive, a leading player in the mobile monetization space. Hillel also contributes to sites such as Gigaom, The Huffington Post, Business Insider and others. You're here: AIM Home » Mobile » What’s Your Mobile Marketing Strategy?